It’s exciting news–Idaho teachers are making real progress using technology. During this past summer, 11 Idaho schools were awarded a total of $3 million as part of the Idaho Technology Pilot Grant. Successful grant applicants were to include a high level of technology integration in their proposals, in order to have the best chances of being selected. And, for the most part, the technology projects were innovative and aligned with students’ needs and instructional goals. For instance, the Kuna School District wanted to continue its use of Google Chromebooks (which I have been writing about since they were introduced), designing a 1:1 program for its middle school. This project is aimed at improving math proficiency, but I’m willing to bet it will improve many facets of the school day and beyond. One of the reasons I get so excited about Google Chromebooks in education is their sheer power, flexibility, and affordability. A Chromebook can be used in almost all of a student’s daily activities. They are durable and have a long battery life. They don’t require software updates or anti-virus programs, as all updates are done in the Google cloud. Students’ work can be stored in Google Drive. 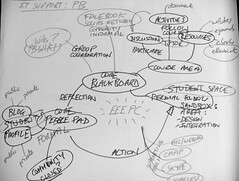 It’s a tool that can greatly increase engagement, productivity, learning, creativity, collaboration, communication. The teachers at Kuna Middle School will take advantage of the tools available through Google Apps for Education–all free tools that can save a school tens of thousands of dollars in software costs. Add these savings to the reduced costs of IT support (no need to upgrade programs, computers, install software, create networked drives), and it’s a no-brainer. How else might we cut technology costs at schools? We could eliminate a lot of the proprietary tools Idaho schools are using. The State of Idaho recently (well in the last year of so) purchased a statewide license with Blackboard, a proprietary course management system. While Blackboard gave them a “deal,” it still cost Idaho taxpayers a chunk of change. Were there other tools that should have been explored and tested? And what about software that allows parents to view their child’s grades? These licenses are not cheap, either. Might there be an open-source alternative–a better way to do this? Can we keep more money in Idaho? How about funds that are leaving our state and going to schools like Brigham Young? High school students who need to earn credits in certain courses are encouraged to take independent study courses online from BYU: http://is.byu.edu/site/. Why can’t the State of Idaho offer these courses and use these funds for technology education or other educational uses? Let’s save money, then turn around and use those savings efficiently and effectively. I’m all about saving money when the options are just as good or better with free or affordable solutions. In other words, the solutions have to make sense. From what I can see, 1:1 computing makes sense, using free collaborative software tools makes sense, and taking courses online from Idaho institutions makes sense. So, let’s figure out how we can save money on one end and then put this money into the hands of schools, teachers, and students to spend wisely on technologies that work for them. One of the best perks of being an online instructor is that you don’t have to be anywhere specific–you can do your work from any place that has a connection to the Internet. In the real world of Things Happening That You Don’t Plan For, this becomes especially useful. It all started two weeks ago, when I broke my ankle. Not a major fracture that required surgery or anything–just a small chip of bone sloughed off of my talus caused by the forceful impact and subsequent twisting of my ligaments, resulting from stepping off of a garden wall onto ground that moved from a few inches to a couple of feet. Being unaware of your surroundings is something we should all try to avoid. The chip is so small that an orthopedic surgeon had trouble pointing it out to me on the blurry print copy of my X-ray–but it was there, and by golly, I sure felt it. This accident not only caused me great pain–it affected my husband, too. You see, it was a Sunday, and he was just getting ready to play golf. Imagine his despair when I told him he had to come home because I had just sprained my ankle. That is real devotion. Fortunately, my husband is an active outdoorsy-type of person and has been in all sorts of daredevil accidents–broken collarbones, ribs, and also has had knee surgery. Subsequently, he has all of the right equipment–ace bandages, ice packs, Ibuprofen, and most helpful in my condition–crutches. He had to pick those up at his office before driving me to Urgent Care, so I had some time to focus on deep breathing and appearing upbeat and relaxed–even joking that maybe I was making a mountain out of a molehill. And that’s probably one of the best reasons for teaching online. During this semester, I’m trying something new. I’m asking students to NOT send me emails. Yes, you read that right–no emails, please. Instead of composing an email, sending it, waiting for me to read it, think about it, then respond, I’m asking my students to communicate with me using Google+. If you have not used Google+, you should. It’s a powerful communication, collaboration, and publication tool that can not only increase your productivity, but can save you from the email monster. 2. 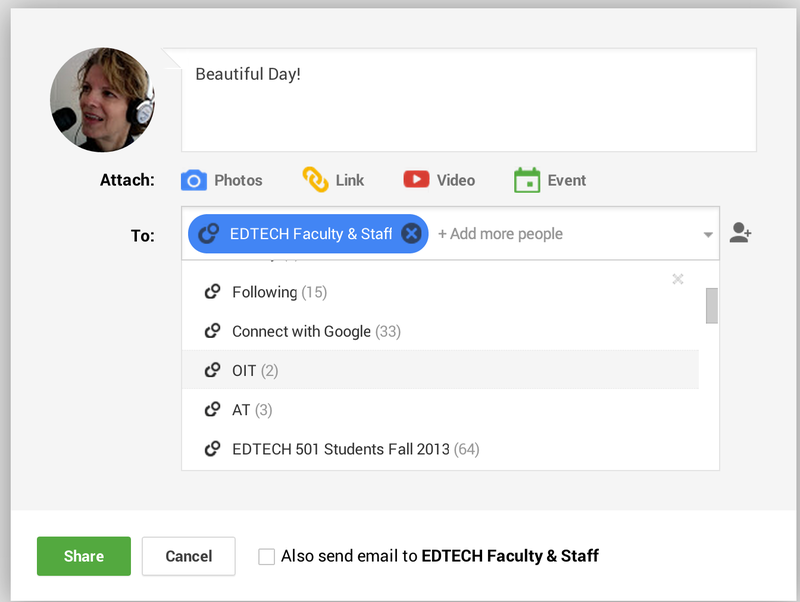 You can view your new notifications in Google+ and respond to them quickly and efficiently. I find this particularly helpful in staying on track and up-to-date with messages and responses. 3. You can edit your messages. For an English major, this is indispensable. I can’t tell you how many times I cringe when I’ve viewed an email I’ve sent with spelling errors. With G+, you can always edit your messages, add more content, whatever. 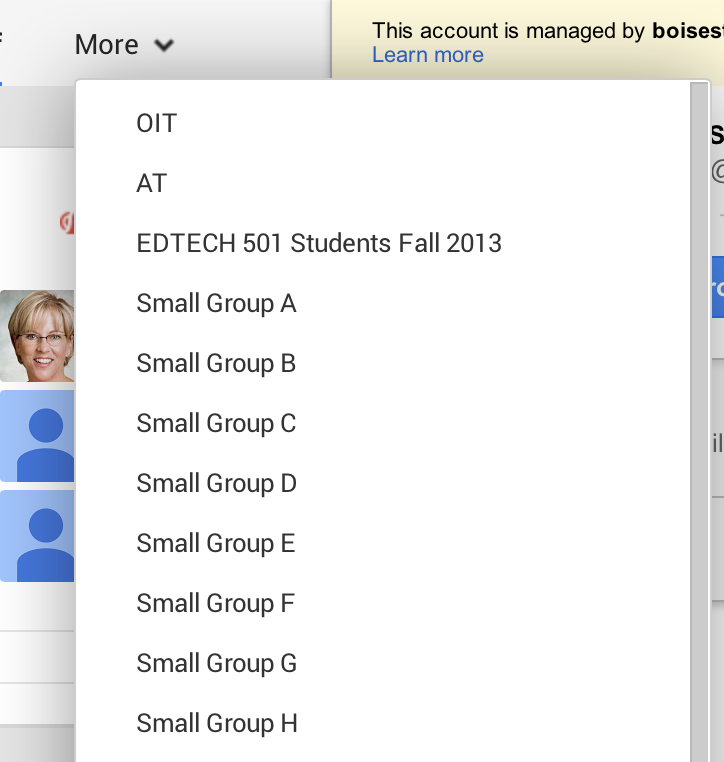 Instead of sending yet another email with information you forgot to include, you can edit your original G+ post. How handy. 4. You can delete messages. Let’s say you realized you didn’t need to send a message. You can delete it in G+. That’s it. Easy. 5. You can mention someone in your posts. Google+ allows you to add a person’s G+ name (you enter it with a + in front of it) in a post, which isn’t sent directly to them, but alerts them they are mentioned. Perhaps you are referring to a person’s post and want them to know how you feel about it. I guess the email equivalent of this would be to copy someone. 6. You can re-share posts to other people, circles, and/or communities. Let’s say you just read an interesting post and wanted to re-share it with your faculty group or class community. It’s easy to do that in G+. Try doing that in email (which would be the equivalent of forwarding an email.) Unless you already had groups set up, you would need to enter each email address. Kind of inefficient, isn’t it? 7. You can disable re-shares of posts. This allows you to not allow re-sharing of your posts. Perhaps you sent a private message and do not want that person to re-share that message. Of course, he or she could easily copy and paste your message and whirl that around the Internet, but this would be unethical and inappropriate. 8. You can analyze your activity in Google+. Using a tool called “CircleCount,” you can view all sorts of statistics on your G+ activity–what was your most read post, days and times people commented on your posts, the number of re-shares, and other valuable data. In my case, I use this information to plan and implement better communication tactics. For instance, I’ve discovered that most of my students comment on posts during Wednesdays, Saturdays, and Sundays, with Sundays by far being the most comments. This is not a surprising fact, since most of my students are working teachers who use Sundays and weekends to complete their work. Another tool called Allmyplus provides additional statistics that help you analyze your activity and identify best practices for sharing. 9. Threaded conversations are easier to follow than email. Let’s face it–email that contains multiple threads and different people you’ve copied can be confusing and messy. G+ posts are easy to follow and track, and searching within Google+ provides you with more valuable information than searching your email inbox. 10. Email resides in your inbox–Google+ is about reading, writing, sharing, publishing. Email is contained in isolated spaces–your email inbox. Google+ posts can be private, of course, but can be re-shared and also shared with your custom circles or the entire public–the choice is yours. By using Google+, you are participating in a more varied and dynamic environment–you aren’t working in isolation. People comment on your posts, they re-share them, and you become part of a growing, robust community of people who want to share knowledge. What are your thoughts? Are you using Google+ on a regular basis? Do you still use email as your sole communication tool? Please post your comments–I’d love to hear from you. Now, I have discovered Hangouts Interpreter App, which allows you to assign someone to interpret using ASL. The video appears in the upper-right of the screen. I haven’t seen this in action, but it appears that when the interpreter is signing, (s)he is in the active screen too. This would allow a student who is deaf to actively participate in a Google Hangout (of course you need to schedule an ASL interpreter to join the meeting) and then communicate to the group using the chat feature. Or, the student who is deaf could sign to the interpreter, who could then provide the communication back to the group. Of course, a person who is deaf could easily use Google Hangouts to communicate with another person who is deaf, both using their webcams and ASL. They no longer need to be in the same room. The world is really changing and offering many more options for people with special needs, due to rapidly evolving technologies. I am hoping to test these tools and am excited about the prospects for the future. Set Up Google Hangouts Ahead of Time with Google Calendar Event–Sweet! If you are using Google Hangouts, you know how easy it is to quickly meet online, chat, share resources, and perform many other tasks, such as working on a Google Drive file together in real time. However, did you also know you can set up a Google Hangout meeting in your Google calendar and set it up as a video call, which will automatically create the Hangout link for you? With the advent of Google+ and other nifty social networks, I’ve found I’ve been blogging less and less, yet writing more and more. Well, let me be more clear about this–I’ve been blogging less and less to a “traditional” blog. As I’m usually always logged in to Google and can easily access its rich suite of tools, I am still blogging–just in a different venue. I find I’m using G+ as a way to blog more often and more consistently. It’s so handy and so easy. 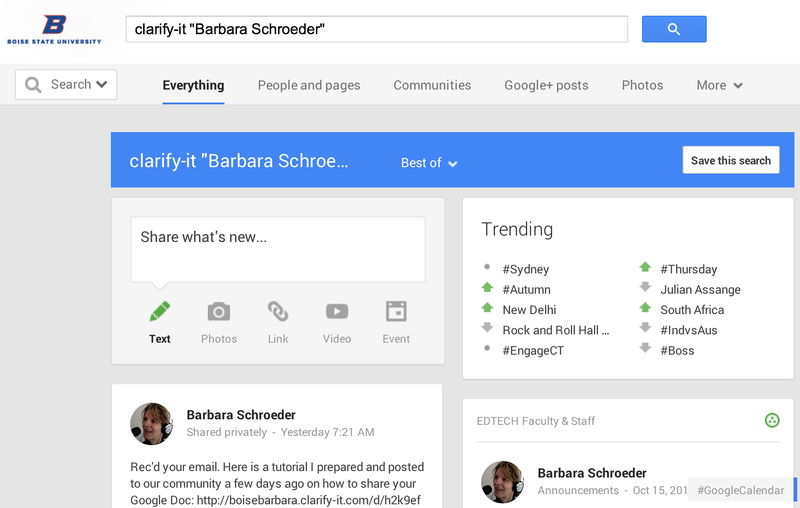 If you are still wondering what the heck Google+ is, I advise to just jump in and try it out. Test it with your husband, your kids, your friends–whatever–to see how it works and how you might use it. The main stumbling block, I think, is getting the hang of circles. Even I, sometimes, need to think things through. The main thing to remember is that you can share content with a person (just like email, so here is one way you can get rid of the email monster), with one or more of your circles that you create, with the public, and/or with a G+ Community. Other people cannot view who is in your circles. Describing these processes is much more difficult than just getting in there and seeing how it works. One of the confusing aspects for some people is sharing posts publicly. This simply means your posts are visible to anyone who is following you or added you to one of their circles. If you are a member of a G+ Community and share your post publicly, it will NOT appear in the G+ Community Stream. That is because a Community is like a circle–you need to specifically share your content with that community. Think of it–communities would not display all public posts! Another cool thing you can do with circles is of course just view that circle’s activities. Just like going to a G+ Community to view the posts and comments, you can click any of your circles in your Home page and view content from just that circle. Let’s say I wanted to view content posted from a Small Group Circle I have created in one of my courses. I go to my Home page, click, the “More” tab at the top and locate my circle. I can also save any searches. As always, thanks for reading and feel free to post your comments by clicking the “Comment” link under the title at the top of this post. If I’ve made any errors or you have discovered other tips about circles and sharing in G+, please let us know. It has come to my attention that I may have left out a very important piece in my keynote address this last Thursday during the Idaho Library Association Annual Conference–the critical role of Idaho school librarians. I apologize for this and want to make sure that I clarify certain content from my presentation. As you know, I feel that Idaho libraries are leading the way, compared to our educational system. Librarians are very skilled at using technology and have made that transformation from analog to digital. And of course, I should have been very clear by stating that when I refer to Idaho librarians, I am also talking about Idaho school librarians. As I said in my presentation, in many schools, the only places where students have access to Internet-connected computers are in school computer labs and school libraries. School libraries and librarians serve an essential service to the schools. Not only do they offer the tools students absolutely need, but they provide essential technology instruction to students and curricular support for Idaho teachers. I also realize that teachers and school librarians are severely limited in how they can offer technology-infused instruction by financial restrictions, school policies, and lack of an overall state plan for providing Internet access at home for all students. I am not placing blame for digital inequalities on teachers, librarians, or school librarians. In fact, if it weren’t for your tireless work and visions for the future, we would not be where we are today. What I would like to see is removal of restrictive Internet policies in our schools, real planning for technology access outside of the schools, and creative ways we can really address severe discrepancies in student achievement across various socio-economic and ethnic groups. We need to help ALL students reach their full potential, and I argue that one of the essential elements–helping all students have high-speed Internet access at home–is not being addressed nor implemented. It’s not the only piece of the puzzle, but it’s an important one, and one that needs our lawmakers’ attention. We read, write, view, evaluate, communicate, collaborate, and most importantly CREATE using powerful technology tools. We need to enable all students to experience these opportunities, and through this, I believe student achievement levels have a better chance of improving. I gratefully acknowledge and credit the work that Idaho teachers, school librarians, and librarians are doing every day. Let’s work on this together to keep pushing for digital and social equalities in our schools. And one more thing–I would be delighted to visit your school library, learn more about what you are doing, and help you come up with ideas for improving student access to technologies and high-speed Internet. Please feel free to contact me at bschroed@boisestate.edu.